Originally introduced from America during the late nineteenth and early twentieth centuries the grey squirrel has spread widely and today is a well-known feature of British parks, gardens and woodland. Grey squirrels – rather like rabbits, foxes and one or two other “pest” species – split public opinion and while many people enjoy seeing and feeding them, others view them as nothing more than tree rats. Entertaining though their antics undoubtedly are, they remain a serious forestry pest, causing considerable damage each year, especially to young trees. The householder too may find that they can make quite a nuisance of themselves. Agile, bold and inquisitive creatures, they can soon learn how to raid a bird table and may then add insult to injury by digging holes in the lawn to hide the food they have stolen. More seriously, they can find their way into roof spaces – either by climbing the walls or leaping across from a nearby tree – where they can be very destructive, tearing up insulation to use as nest material and chewing the timbers. They have also been known to strip the insulation off electric cables – a major potential fire risk. 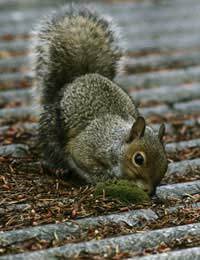 The Grey Squirrel is a surprisingly large animal, its head and body being around 25cm in length with a tail almost as long again and weighs in at around half a kilogram. Active during the day – and most especially around dawn and dusk – they forage for a wide range of food, including fruits and fungi in addition to their traditional diet of nuts and they will also take eggs or young birds. They breed twice a year – in early spring and then again in the summer – producing three or four young, though exceptionally up to nine may be born. These youngsters will themselves be able to breed at a year old. Squirrels make nests – known as dreys – to shelter in, usually constructed from twigs and lined with soft, warm materials, such as moss, dry grass or feathers. Normally these are located high in a tree – typically in a fork of a branch – though sometimes they are made within a hollow in the trunk or built on a vacated crow or rook nest. Each squirrel may make several dreys and they may also try to construct one within a roof space – leading to the sorts of problems mentioned earlier. It was once believed that Grey Squirrels killed the native Red Squirrels or drove them away, but this does not seem to be the case, as the two kinds appear to be able to rub-along together for about 20 years in a wood before the Reds eventually disappear. It seems that the Greys, being stronger and more able to adapt, simply out-compete their cousins and being a little more successful gives them the upper hand, over time. They are the most commonly seen squirrel in England and Wales, though the Reds fare better in the conifer forests of Scotland. Thoroughly blocking up any likely holes and gaps will help prevent squirrels from entering the building, but only if it is done properly. These animals are rodents and – like their mouse and rat relatives – their front teeth grow throughout their lives, only continual gnawing keeping them at the right length. This makes them very capable chewers – so only suitably squirrel-proof materials should be used! Particularly treasured individual trees within a garden can be protected by specialist metal collars or sleeves, but this is really only possible on mature trees which will not be rapidly increasing their girth, as a tight fit is essential. If prevention does not stop the problem, then killing them may be the only solution and if so, the best course of action is almost always to call in the professionals. A variety of methods are possible, though kill-trapping and poison cannot be used where there is any risk of harm to Red Squirrels – a protected species in the UK – and shooting is seldom practical in towns. Live trapping is often used and while suitable traps can be purchased, it is illegal to release a trapped Grey Squirrel into the wild, so any that are caught must be humanely destroyed – definitely a job best left to the experts. One of Britain's most frequently seen and most instantly recognised mammals, the Grey Squirrel brings great pleasure to many people, though it remains a potentially destructive tree rat, albeit a very engaging one. Much, of course, depends on where they are found. Even in a commercial forest, a small number might be a tolerable nuisance, while a large population clearly would not; a couple in a garden may do little harm but just one ripping your loft to shreds casts a different light on things. Just like the old saying about a weed being a wild flower growing where it is not wanted, what we choose to label “pest” often comes down to our own point of view. I retired from the telephone company after 30+ years, when I became unable to climb poles. Squirrels are nothing more than a big RAT with a fuzzy tail that can climb! They're dirty, filthy carriers of diseases that have caused millions of dollars in damages to people and their homes, their health and utilities! AND they are NOT afraid of people because people feed them!